In 1978, the Egyptians constructed a canal known as the Toshka Spillway from Lake Nasser into a low area to the west to allow spillover of Lake Nasser water. Despite the fact that the spillway was created in 1978, it wasn't until the late 1990s that Lake Nasser actually filled up to the level of the spillway canal and the overflow lakes began to form. In November of 1998, US astronauts orbiting in the Space Shuttle noticed the lakes filling for the first time, and they have had water in them ever since. Egypt has embarked on a long-term and far-reaching irrigation plan to create habitable land away from the Nile River Valley. The Toshka Lakes are not, however, a formal part of the project. 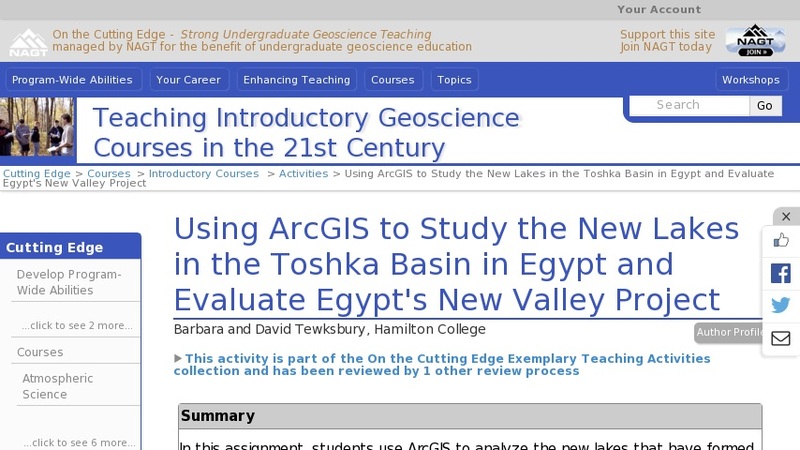 One of the main points of the exercise is to have students use both their knowledge of Saharan hydrogeology and GIS analyses to evaluate whether the Egyptians are wise not to use the lakes as part of the proposed system of water distribution. In this exercise, students download and prepare their own SRTM DEMs and learn how to determine areas and volumes using ArcGIS. They can then ask questions and use ArcGIS to determine the answers. How much water is in the Toshka Lakes? What happens if Lake Nasser rises and more water flows down the canal? Will more lakes form, or will the lakes that are there just get bigger? How much water might be evaporating from the lake surfaces? How much water has to flow down the canal to keep the lakes at a particular level? What might happen as the annual Nile flood fluctuates from year to year? The document posted for downloading contains two homework assignments, two in-class activities, and a wrap-up assignment. You can also download a GIS Primer (Acrobat (PDF) 1.2MB Mar30 10) that we have written, which is a simple GIS "how-to" manual for tasks including those used in this exercise.